The uniquely shaped Hex Logo Morale Patch is printed with the Maxpedition "M" logo--industry leaders in quality tactical bags, equipment pouches as well as a broad host of other travel and survival gear. It is made from durable and flexible PVC rubber, ensuring lasting toughness and reliable wear that will survive extreme outdoor and combat conditions. The choice of material also makes the patch easy to maintain and clean with regular soap and water. 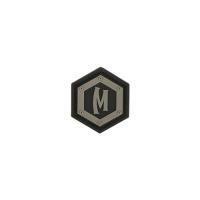 The "M" Patch features a hook-backing that attaches to any loop surface, including those on many Maxpedition bags. It also comes with an additional loop sheet that can be sewn onto clothing or other accessories.